Body Contour Wrap – Your Way To Wrap The Flab Up And Get Contoured! What Is Body Contour Wrapping? The Body Contour Wrapping (also referred to as ‘Body Cocoon’, or ‘Body Mask‘) is basically a spa treatment in which the entire body is exfoliated, wrapped, and moisturized respectively to help women look and feel slimmer. The idea originated decades back when linen sheets were used to make ‘herbal wraps’. Now, they have evolved into thermal or plastic wraps. It is an all-natural and highly effective way to cleanse and detoxify the body, thereby causing temporary inch-loss, giving a contoured body, and enhancing the skin texture. How Does A Body Contour Wrap Work? You need to lie down on a table covered with a thermal blanket and your whole body is exfoliated with a salt scrub and a body polish followed by a shower. A unique mineral-rich clay body wrap solution is applied all over your body. 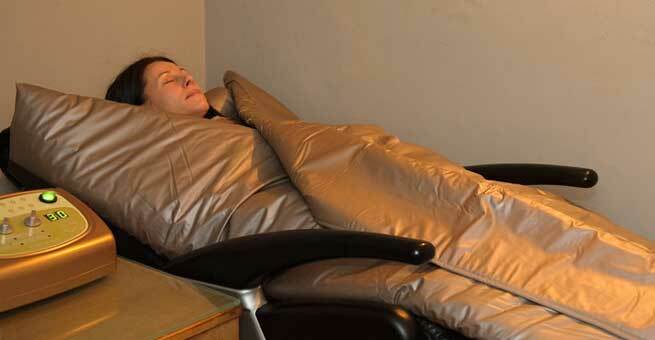 You are wrapped in the thermal blanket to produce heat and keep you warm. You are also left alone in the room and allowed to relax completely. Once the time is up, you are unwrapped and rinsed thoroughly. Finally, a lotion is applied all over your skin to moisturize it well. These wraps are meant for moisturizing and de-stressing. They involve the massage of the skin with mud, oil, or cream and then, the clients are wrapped and allowed to relax in a quiet ambiance with soft music. These wraps are formulated especially for women who tend to make feel bloated due to water retention. They work through water elimination, which offers results almost similar to rigorous exercise. These wraps eliminate toxins from the body by throwing them out through skin’s pores. As a consequence, you will notice considerable differences in flabby areas of your body like the stomach, thighs, hips, etc. The body wrapping takes 1 hour to 2 hours and the effects can last up to one month. The cost of a body wrapping treatment may vary based on the types of wrap and the spa locations. However, it typically ranges anywhere between $70 and $300 for each session. Your body gets detoxified by itself through the pores of the skin and that too in an all-natural way. It reduces the water weight of your body by eliminating excess water from it. You will start losing extra body weight and not gain additional weight anymore. If cellulite has been bothering you, it will act as a quick fix for that. Your blood pressure is lowered and your overall health gets improved. Exfoliation right before wrapping removes dead cells from the surface of your skin, revealing a fresh layer of skin underneath. Natural ingredients used in wrap solutions provide deep moisturization to the skin, which is even intensified with the application of heat. As the toxins are flushed out, your skin becomes much tighter, smoother, and healthier with a lesser appearance of acne. It works as a good stress reliever by relaxing the body and mind completely. The procedure is simple and easy to do as you only need to lie in the wrap without following any complicated step. The results are immediate and you can expect to lose a few pounds right from the first session. It is a temporary fix rather than a permanent solution for weight loss. It may not be suitable for women with sensitive skin as the ingredients or fragrance of certain body wraps can cause allergies or uneasiness. If you are claustrophobic, you will definitely not like to be ‘mummified’ and left in a dark room for hours. So, steer clear of this procedure. It is not a one-time procedure. You will need multiple sessions to flush out toxins from your system regularly and enjoy the best results. Based on the type of wrap chosen, the process can be expensive enough if all sessions are considered together. Is A Body Contour Wrap Safe? While body contour wraps are considered as a ‘safe procedure’ for not involving any kind of medication, it actually comes with ‘strings attached’. No matter how efficiently it cleanses your tissues and how relaxed you feel during the process, you should actually know the side effects before following the trend blindly. Body contour wraps can cause too much water loss, which can result in severe dehydration. It is crucial to consume plenty of water throughout the day in order to stay hydrated. Excessive dehydration can lower the volume of blood in your body, thereby leading to circulatory problems. Thus, you may suffer from hypovolemic shock, which can turn out to be fatal. You may end up developing allergies or temporary rashes from certain body wraps, which can be cured by drinking lots of water (at least half your body weight) every day. Hence, stay away from body contour wraps If you are having a medical condition or taking prescription medicines. Checking with your physician beforehand is always a wise idea. Also, ensure that you are having a healthy diet and exercising regularly to make the most of your wrapping efforts.